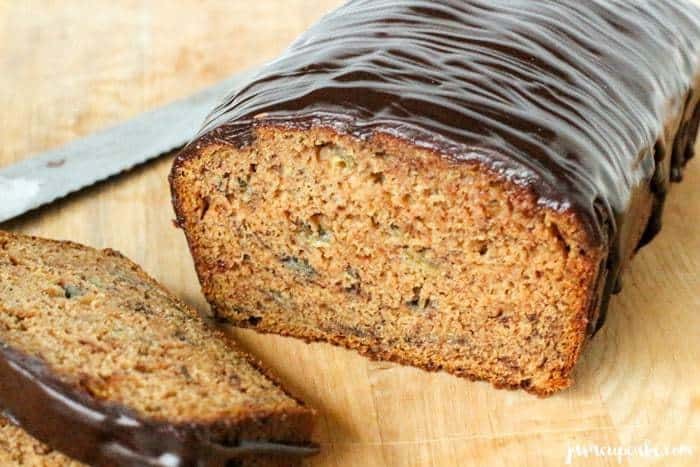 Take your banana bread to the next level by making this simple, delicious Pumpkin Banana Bread with a Chocolate Glaze! 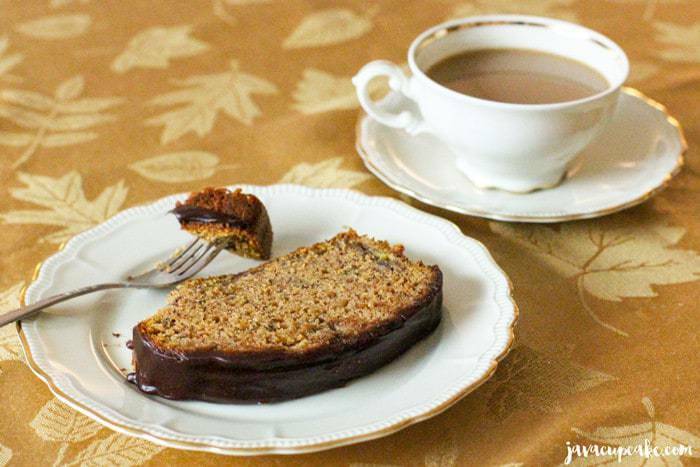 It’s moist, flavorful and so easy to make! I’ve teamed up with 25 amazing bloggers to bring you this mouthwatering round-up of incredible Thanksgiving recipes! So make sure to scroll down to see all the amazing recipes, visit their blogs and enter to win! I had a few bananas that need to be made into bread but was tired of the same ole recipe. So, for this bread since it was just about to be pumpkin season, I thought why don’t I add pumpkin to my traditional batter and see how that turns out? This recipe made one large loaf and one smaller one to share with a friend. You can see in the picture above the two sizes I got. I’m sure you could use two medium size pans to get two of the same size or several small ones or even fill up the big one to the brim! Adding a chocolate glaze to the top of my bread was an after thought, but boy am I glad I did! That bit of extra bitter sweetness is the perfect decadence that makes this bread really special! That and I used my beautiful new Bavarian porcelain china to enjoy a slice of bread and a cup of tea. Everything tastes better when it’s served on something pretty! Preheat oven to 350F degrees. Grease, flour and line with parchment paper one large 9x5in loaf pan. Prep a second, smaller pan (whatever you have on hand) the same way. This recipe makes enough for one large loaf with some leftover for a smaller as well. In the bowl of your stand mixer, cream together the butter and sugar for 1 minute. Add the eggs and vanilla and beat together for 2 minutes until light and fluffy. Mix in the pumpkin puree and the mashed bananas until incorporated. Make sure to scrape the sides of the bowl to ensure everything is mixed together. In another bowl, whisk together the flour, baking soda, baking powder, salt and pumpkin pie spice. Add this to the wet mixture in two parts mixing until just combined. Do not over mix! Pour about 2/3 of the batter into the large prepared pan or enough to fill leaving about 3/4in of the pan free. Pour the remaining in the smaller pan. Bake for 50-60 minutes or until a toothpick comes out of the center clean. If you underbake the bread will fall in the center. The smaller loaf will take less time, check after 20-30 minutes. Allow the breads to cool in the pan for 5 minutes before removing to cool completely on a wire rack. 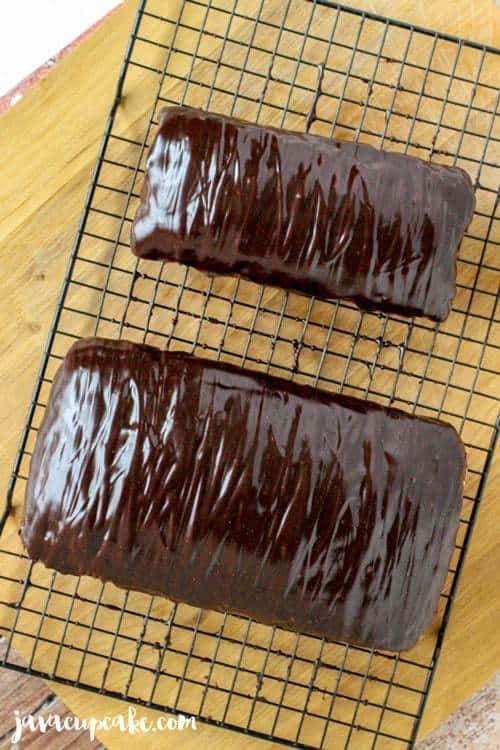 Pour the chocolate over the loaves and spread gently to the edges. You want most of the chocolate on the top, not the sides. Do not slice until the chocolate has set. Click on each image or link to check out the recipe & enter to win their giveaway! Remember, more than $1250 in prizes are up for grabs! I’m giving away a $50 Starbucks Gift Card to one lucky JavaCupcake reader! Open to anyone who can use this gift card in the USA. Fill out the entry form below to qualify. I always pile on the sweet potatoes! I LOVE the canned cranberry jelly (kind of embarrassing, lol)! My mom loved that too! I never liked cranberry until I made it from scratch! My least favorite used to be dry turkey breast, but that isn’t a problem any more since my brother started frying the turkey! Now every thing is a 10+!! I’ve never had dry turkey breast… I hear people talk about it all the time, but I can understand why you’d dislike it! i love the cream cheesed mashed potatoes! Stuffing, with a bit of mashed potatoes and gravy mixed in! This chocolate glaze is genius! You can never go wrong with sweet potato casserole!! It isn’t Thanksgiving without my mother’s stuffing, the classic with onion & celery! I am tasked with making it now, as she passed on in 1995. But her recipes live on & make family events so comforting! Family traditions and recipes are the best!!! I can never get enough mash potatoes and stuffing! I love my Sweet Potato Casserole that I make every year! My favorite side dish is wild rice. My Thanksgiving favorite is STUFFING! Though I think I might give even IT up for the chocolate glaze on your bread!! Mmmm, it looks divine. I like to mix all my whole plate together (mashed potatoes, turkey, gravy, stuffing green bean casserole etc) and have a giant yummy plate. I like the pumpkin pie. I love to eat chocolate chip pecan pie! Apple pie is my favorite part! Hanbds down, pumpkin pie. That’s my favorite one to eat and Thanksgiving is the time to do it! I love pumpkin pie too. Especially with freshly whipped cream! I always like the homemade mac and cheese. Sweet potato soufflé is my favorite to eat at our feast! My favorite of the savory stuff is the Cornbread Dressing with gravy and jellied cranberry sauce! Thanks for the chance to win. Oh, the sweet part is the pecan pie or chocolate cream pie. Gluten free strawberry rhubarb pie! I love the turkey with gravy. Love the chocolate glaze to top it! Yum! I love the stuffing more than anything! My favorite would have to be my moms Stuffing….. she puts fried up pieces of liver and mushrooms into it! That and the Green Bean casserole of course!. NOM! so good…… This year, for only the 2nd year ever, (first year away was in 2006 when I lived in Boise for a minute.) I’m not spending it with my family. Going to my boyfriends family dinner. I’m hesitant….. but am sure it will be fun and delicious! I’ve been trying to figure out what to bring- and with the Chocolate Glaze this might be the winner. Happy Thanksgiving!!! Liver and mushrooms? I’ve never heard of such a thing… but I can imagine all that flavor is amazing!!! Happy Thanksgiving right back at ya, Kit! I always have to make pumpkin cake with cream cheese frosting!!! Pie, I look forward to the variety of pies we get to eat for Thanksgiving ! I love my mom’s layer salad! My fav is the homemade stuffing. By far my favorite Thanksgiving dish is apple stuffing!! I have two favorites- corn bread casserole and sweet potato casserole with marshmallows and corn flakes! 16 more days until we meet again, can’t wait! Waahooooo!!! The countdown is on! 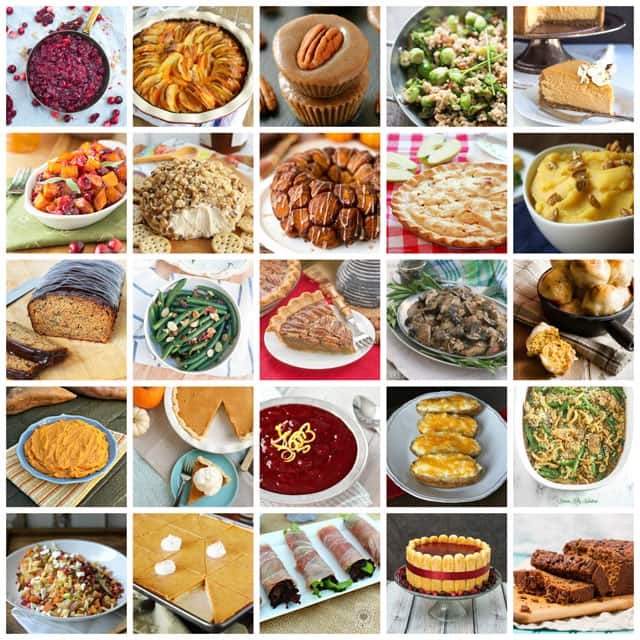 My favorite are definitely cornbread stuffing and sweet potato casserole. My favorite thing to eat is the dressing! My favorite thing is pecan pie. The gravy. I should ask for my own tub of gravy and just dip things in it all day long. I love mixing my mashed potatoes and gravy and corn together. My favorite dishes at Thanksgiving are homemade noodles and sweet potato casserole. I don’t know that I can pick between those two! Stuffing with gravy is my favorite. I love cranberry sauce, whether homemade or just from a can. Sometimes I’m the only one at the table who eats more than a bite or two of cranberry, I love it! I make this big bowl of cranberries every year from scratch and everyone just looks at it like it’s a disease. I love it though! I like eating sweet potatoes! I love to eat Noodles! My favorite thing is pumpkin pie. Turkey w/gravy is always good. My favorite thing to eat at Thanksgiving is chicken and cornbread dressing. I like the turkey but also pumpkin cheesecake. My favorite thing is pumpkin pie! green bean casserole. I love it and it such a simple recipe. Pumpkin pie is definitely my favorite thing to eat on Thanksgiving! What a fabulous loaf! And that chocolate glaze is a phenomenal addition!!! At the Thanksgiving table my favorite food is pumpkin pie with real whipped cream. That bread looks delicious! 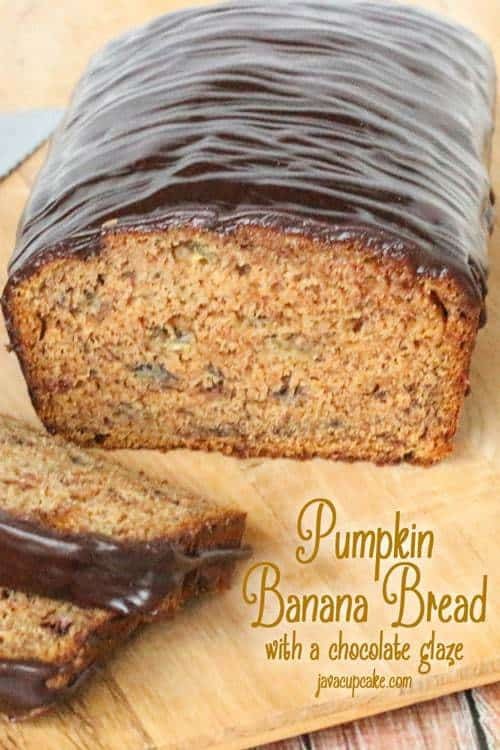 Banana bread has always been my favorite and the fact that you added pumpkin is amazing! Yum!! I always look forward to eating stuffing each year. It has always been my favorite! I love eating the rolls! My favorite! My favorite thing to eat at Thanks giving is my grand mothers cran berry stuffing. Mashed Potatoes for me, please! Yum! sausage stuffing is my favorite! My favorite thing to eat at Thanksgiving is stuffing smothered in gravy. My favorite thing to eat is green bean casserole. Cornbread dressing and gravy is my favorite. I look forward to it all year. Stuffing is my favorite. I think this is the only time of year that I eat it! My favorite is my daughter’s Pecan Pie. My favorite is the pumpkin pie! I love the cranberry sauce b/c it’s the only time of year I get to eat it. Having celiac, we’ve really dialed in our holiday meals. I’m not sure if I love the stuffing more or if it’s the pumpkin cheesecake! The sweet potatoes, so good! I love my maple roasted sweet potatoes! My favorite thing to eat at Thanksgiving is stuffing!! I just love it! At Thanksgiving, my favorite to eat is stuffing and mash potatoes and gravy!! Yummy. The version of my grandmother’s bread stuffing recipe we make every year! The herb stuffing my husband makes is my favorit Thanksgiving food. I love the stuffing its my favorite. Turkey is my favorite at our Thanksgiving feast. I always love stuffing at Thanksgiving. We use my mother’s recipe and it never disappoints. My favorite thing to eat at Thanksgiving is pumpkin pie! Mash Potatoes are my favorite. Multiple helpings every year. I love mashed potatoes with gravy. I love the stuffing and pumpkin pie! My favorite dish on the Thanksgiving dinner table is homemade dressing with gravy. I love the turkey and the stuffing. I make a pumpkin choc chip bundt with chocolate ganache and it s probably my fave cake of all cakes I make. Yours looks amazing and I want to try it! Pinned!